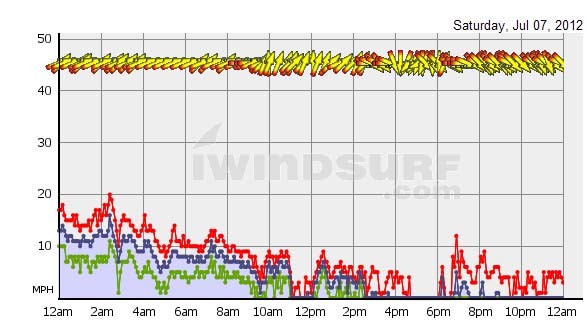 iWindsurf Community :: View topic - Will the wind ever return to the East Coast? Will the wind ever return to the East Coast? Posted: Tue Jul 10, 2012 6:17 am Post subject: Will the wind ever return to the East Coast? A little ambiguous since a bad forecast could mean the difference between actual and forecast. How about the worst actual. Here's an example - Ned's Point, the day before a cold front. Fair enough. Here's my wind observations summary from a recent weekend morning. Don't need a table to tell ......there is no wind..
We haven't heard from the Hatteras crowd because they are hogging it all again. i've been watching the s.padre readings, and they seem to be having upper teens to low twenties all summer so far. surf cam looked good after last tropical system for awhile too. about 2000 miles from the east coast though. Yep, its been windy here on the OBX! SW near daily riding everything from SeaLions to small kits. Only thing lacking has been chest+ sized surf, but will take the 80 degree crystal clear tropical-like ocean side water! There have been shark tourneys off LI for decades. At least since I was a kid in the '50s. Here's a report from 2010 Montauk shark tournament, where a Great White Shark was taken by ... mistake. Fortunately, LI doesn't yet have the "seal for a meal" program completely up and running. Give them time.